Media reports have put Marchionne's 2014 pay from as little as $8 million to $72 million and more. Late last week, Fiat Chrysler Automobiles filed its annual report with the Securities and Exchange Commission, setting off a flurry of stories about the compensation of its sweater-clad CEO, Sergio Marchionne. The numbers, from The Wall Street Journal, Reuters, Bloomberg and others, varied widely: from as little as $8 million to $72 million and more. Yeah, really. Admittedly, some of Marchionne’s compensation package is wildly confusing given the structure and how it is reported. There’s the conversion of euros to dollars to consider, the value of stock options and other variables. Well, in the rather-confusing matter of how much Marchionne was paid in 2014, allow me to throw out my own number: $55.5 million. That’s roughly how much -- in equivalent dollars based on a Dec. 31, 2014, euro exchange rate of 1 to $1.21 -- the enigmatic CEO was paid in cash, bonuses and benefits last year, according to the company’s SEC filing. I’ll break it down in a minute, but Marchionne also received other equity-based compensation in 2014. Given the volatility of the share prices and when they vest, this compensation is harder to account for, but at a minimum, the options and awards put the 62-year-old over $100 million by a comfortable margin. Chairman: Marchionne received $1,718,200 in cash and $290,400 in benefits for being FCA’s chairman. CEO: He received $3,025,000 in salary, $121,000 in benefits, and $4,840,000 in bonus for being CEO. Extraordinary incentives: Marchionne received $29,887,000 as a one-time cash award for, among other things, completing the merger of Fiat S.p.A. and what had been Chrysler Group during 2014. Pension: The company booked another $15,609,000 to pay Marchionne in potential pension/severance payments when he leaves the company. Add it up, and it comes to the $55.5 million, when you factor in rounding. 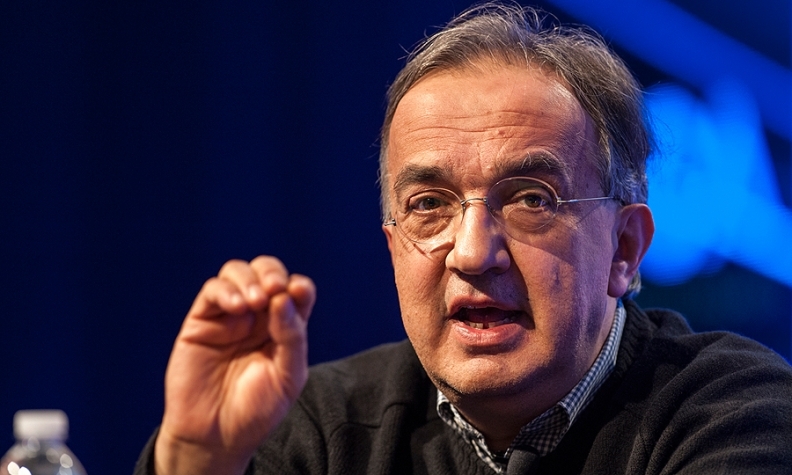 Marchionne received 2,333,333 shares of FCA stock in 2014 under the company’s multiyear, long-term incentive plan. Though received in 2014, the shares vested on Feb. 22, 2015, when the stock had a value of $15.50 per share, for a total of $36,166,662. That should push the tally up to $91.7 million. But we’re not done. Last year, the company’s board also approved a one-time grant of 1.62 million restricted shares of FCA. But the grant must be approved by the company’s shareholders in April before it becomes official. The value of the shares is zero until the award is approved, but at Friday’s closing share price of $15.22, the shares would have a value of $24,656,400. Add this in -- even eventually -- and we’re over $116.3 million. Marchionne also exercised stock options that allowed him to buy 10.7 million shares each of FCA and Case New Holland International stock for the combined equivalent of $7.96 per share, and another 6.25 million shares each of FCA and Case New Holland for the combined price of $16.18. The value of these holdings was reduced when Marchionne sold about 10.4 million of the shares to pay the strike price and tax liabilities, according to a November press release issued by the company. I haven’t included these stock options in his total compensation package, however, because they primarily come from his previous work spinning off Case New Holland from Fiat. For our purposes, I think that’s the same type of outside compensation as Marchionne earns as a board member of Philip Morris International. In other words: It counts for Marchionne, but not for us. So what was Marchionne’s 2014 pay? Was it $55.5 million? Or $91.7 million? Or $116.3 million? Or more? It depends on what’s being counted and who’s doing the counting. Frankly, at this point, does it really matter? And that’s all you really need to remember.